Before you bring your new friends home, it is important to make sure you are set up with all the right kit to look after them. Most important is buying a suitable cage. Here are some things to think about when it comes to mouse cage requirements. How many mice should you adopt? How big does a mouse cage need to be? What size bar spacing should a mouse cage have? How deep should a mouse cage base be? Like their close relatives, rats, mice are social animals and shouldn’t be kept alone. In fact, with mice, even a pair is not ideal. A much better minimum number for a group is a trio. That means that when choosing a cage, it’s best to look for something that can comfortably house at least three mice. 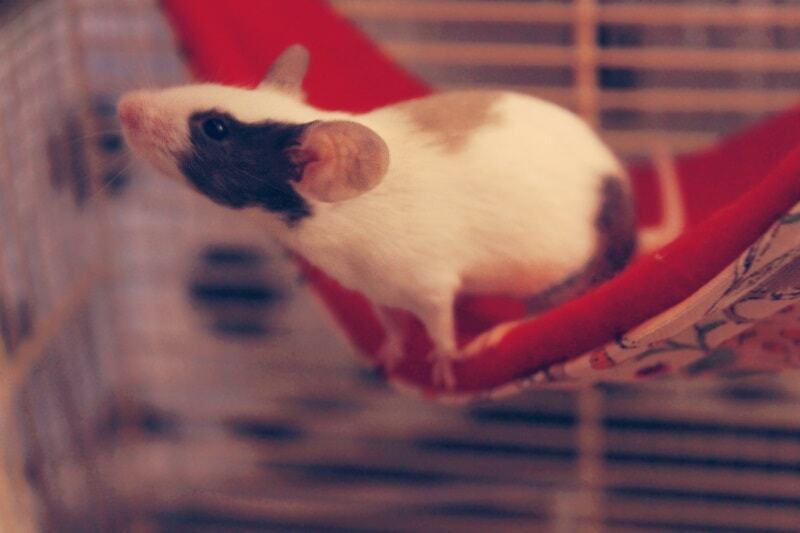 Most pet mice spend the majority of their time in their cage so it needs to be large enough to be a complete environment for them, with enough space and furnishings to allow the animals to express all their natural behaviours without becoming stressed. The good news is that nowadays there is a lot more cage choice for mice owners than there was even 10 – 15 years ago. That does mean that a lot of the advice out there in care books and on older internet sites is outdated – it comes from a time when small cages and tanks were the only options. Now, many pet care brands make big cages with mouse-suitable bar spacing, and with some cunning online searching there’s a cage option for everyone without compromising on health or quality of life. As a guide to sussing out how big a cage you need, you can use a rat cage calculator and double the number of animals to get an idea of how many mice it is suitable for. So, a cage that is suitable for around 4 rats, will comfortably house around 8 mice. The shape of the cage should also be taken into account. Mice love to burrow and digging in their substrate is a really important behaviour for them, so the cage needs a good size footprint of at least 65 x 45 cm / 25.6 x 17.7 inch, with a nice base tub to hold a thick layer of substrate. However, mice also need to climb, so the cage doesn’t want to be too low. 40 cm / 15.7 inch is a good minimum height for a mouse cage. 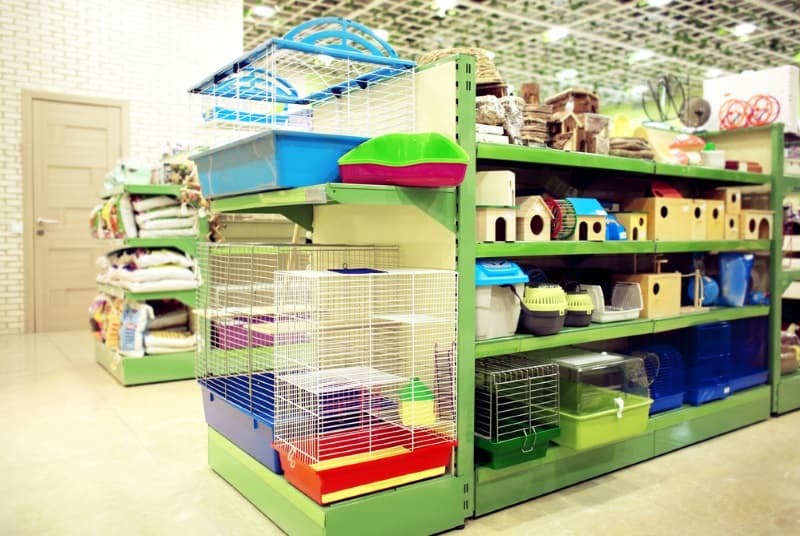 Most cage manufacturers don’t explicitly advertise their best mice cages as being designed for mice, so the prospective owner needs to do some detective work. Looking for cages advertised for other small animals such as dwarf hamsters is a good start, although bear in mind these animals can have very different needs. 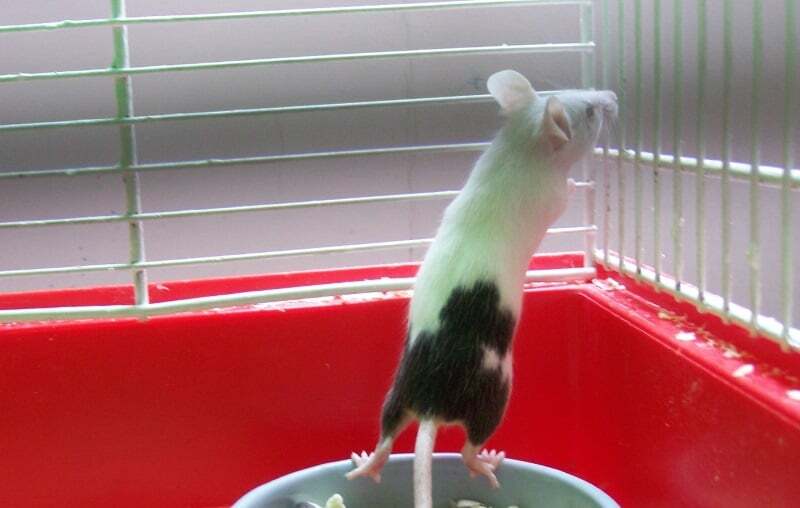 Some rat cages are also suitable for larger mice. Getting the bar spacing right on a cage is crucial to keeping pet mice safe, but it can also be tricky because mice can vary a lot in size. 29-45 g (1 – 1.6 oz) is about average for an adult (not fat) mouse, but healthy adults can range between 24 and 80 g (0.85 – 2.82 oz) depending on the genetic line they come from and how they have been fed as young animals. A difference of 20 g (0.7 oz) in mouse weight can easily make a cage bar spacing suitable or not suitable, so it is really important to weigh your prospective mice (electronic kitchen scales are best – and portable! ), rather than guessing based on their age. If you are buying from a breeder, getting information on the weight and size of the rest of the family is also a really good idea. When looking at bar spacings, remember to measure the actual gap between the bars – this may well be different to the advertised spacing as most manufacturers quote the distance between the mid-point of two bars. That’s less helpful, as it will include the thickness of the metal bar, rather than the space you need to know about. It’s also important to look the whole cage over and spot any areas that might have spaces bigger than the bar spacing. Common places to find gaps are around doors and at the corner of cage panels. These bar spacings are suitable for mice over about 15 g / 0.53 oz in weight (which should include all mice old enough to be sold / homed). Most of these cages are advertised for dwarf hamsters, but some may mention mice explicitly. This is the standard bar sizing on most dwarf hamster cages, and is suitable for the average adult sized mouse. This bar spacing is only suitable for very large mice, and is best avoided as the bars themselves are often weaker, allowing a mouse really determined on escaping to wriggle out. In general, thicker bars are better as thin bars are more flexible and easier for a mouse to push through. Be aware that bar thickness isn’t standard even within one manufacturer’s range, so each cage needs to be considered on a case by case basis. If you have a great sized cage where the bar spacing is too big, is it possible to adapt it? Well, yes and no. Hypothetically, it’s possible to cover the bars of a mouse cage in 6 mm / 0.24 inch mesh, which will provide the security needed. However, the tiny size of the mesh makes it very hard to then attach cage accessories to the bars, making it hard to create good engaging cage set-ups. So, while it is technically possible to adapt a cage as a short-term measure, long-term it’s better to just buy one with the right size bar spacings for your mice. Some possible mouse cages will be a suitable size and bar spacing, but won’t provide a deep enough base. Mice need a good layer of substrate for digging and tunnelling in (which will also help with smells), and as the owner, you want a deep enough base to keep the substrate in the cage and not thrown all over your floor! Ideally, a cage base should be 15 cm / 5.9 in deep, although 13-14 cm (5.12 – 5.51 in) is also OK. Less suitable cages have bases 8-11 cm (3.15 – 4.33 in) deep, which limits digging and increases mess! Why not just use a tank? Given that mice need to be kept secure in an environment with lots of opportunity for digging, why don’t we advise keeping them in a tank? The main answer is health. Tanks used to be one of the main habitats recommended for keeping mice, but that was before a wide range of cages with 6 mm (0.24 inch) and 9 mm (0.35 inch) bar spacing came on the market. Nowadays, with a much wider choice available, we can look more at the potential disadvantages of each option. The main problem with either plastic or glass tanks is that they have poor air circulation, with only one side (the roof) open to the air. Once you’ve filled the tank with toys (many of which will have to hang from the roof) there is very little opportunity for free airflow. Airflow matters to mice because, like many other rodents, they have sensitive respiratory systems, and their lung tissues can easily be damaged by infection or build up of ammonia fumes from urine. Tanks serve to keep those fumes in, meaning not only are the mice exposed to them, but the owner is less likely to notice their build up. Some tanks are designed for use with rodents and have a ventilation strip part way down one side. This is obviously a better option than a tank without it, but it still provides poorer airflow than a fully barred cage. These tanks, along with tanks with cage toppers are primarily designed for gerbils and hamsters, who are desert adapted animals who don’t pee a lot. Mice, who are naturally adapted to a more temperate environment, produce more and smellier pee, and so do best with plenty of ventilation. If you really need to use a tank to house your mice (maybe you own one already and are switching from keeping another animal like gerbils), then it is best to reduce the number of mice kept for the area of the cage. So if you calculate you could keep 6 mice in a cage of that size, then in a tank it would only be suitable to keep three. What about the DIY cages? Some owners opt for DIY cages made out of plastic storage tubs with mesh panels inserted for ventilation. Whilst these can be good options for breeders, they are quite hard to find in a size and shape that gives enough footprint and height, can be harder to set up with a good cage layout than standard cages, and once all the DIY is taken into account, don’t necessarily work out any cheaper. Making cages out of wooden cabinets or bookshelves is not generally recommended as mice will chew it, and the wood will absorb their pee. Most mouse cages will be easy to clean by taking them apart (owners may want a smaller cage or carrier to pop their furry friends in while the main cage is being cleaned). However, it’s still worth thinking about the size of the doors – having a big door on one side, or a number of smaller doors dotted about will make it easier to reach in for spot cleaning, catching a mouse for a health check, or arranging the cage set up. If the cage only has smaller doors, then some accessories like wheels or branches will need to be put in the cage while it is in pieces. A three level mouse palace! What type of cage do you use or plan on using for your mice? Let us know in the comments!